Натисніть на фотографію і подивіться всі доступні фотографії до Baldinini Hotel. Featuring a balcony and partial views of the sea, this rooms comes with air conditioning, free Wi-Fi, contemporary furnishings, and a flat-screen TV. The bathroom has free toiletries and a hairdryer. Please specify bed preference when booking. 2 Задасте дату а виявите наявність, зобразяться а й ціни готелів на даний час. Featuring a sea-view balcony and contemporary furnishings, this large room comes with air conditioning, free Wi-Fi and a flat-screen TV. The bathroom has free toiletries and a hairdryer. Please specify bed preference when booking. 2 Задасте дату а виявите наявність, зобразяться а й ціни готелів на даний час. Featuring a balcony with partial sea views and contemporary furnishings, this room is composed of 2 interconnecting rooms. It comes with air conditioning, free Wi-Fi and a bathroom with free toiletries and a hairdryer. 3 Задасте дату а виявите наявність, зобразяться а й ціни готелів на даний час. Featuring a balcony with partial sea views and contemporary furnishings, this room is composed of 2 interconnecting rooms. It comes with air conditioning, free Wi-Fi and 1 bathroom, which is complete with free toiletries and a hairdryer. 4 Задасте дату а виявите наявність, зобразяться а й ціни готелів на даний час. 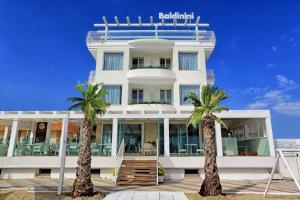 Set on the seaside promenade in Rimini’s Torre Pedrera area, Baldinini Hotel offers an equipped terrace, an à la carte restaurant and free bikes. It is a 10-minute drive from Rimini’s town centre. Featuring a balcony and contemporary furnishings, the rooms come with air conditioning, free Wi-Fi and a flat-screen TV. The bathroom has free toiletries and a hairdryer. Your sweet and savoury breakfast is served in the dining room, and in fine weather on the terrace. The restaurant, outdoors in summer, offers Mediterranean, seafood and vegetarian cuisine. The nearest train stop is 350 metres away, while Rimini Train Station is a 10-minute drive from the property. Aquafan Amusement Park is around a 20-minute drive away. On-site free parking is available.